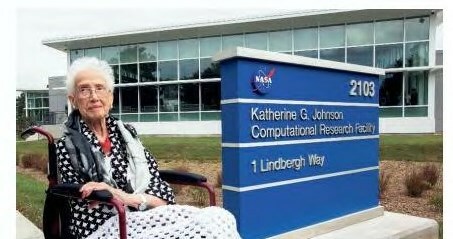 Katherine Johnson, 99 years old, in front of the new NASA computation research facility named in her honor. When she heard that NASA’s Langley Research Center in Hampton, Virginia, would name its newest building after her, Katherine Johnson responded the only way she could – with surprise. “You want my honest answer? I think they’re crazy,” the 99-year-old Johnson, of “Hidden Figures” fame, said with a laugh. The Katherine G. Johnson Computational Research Facility, or CRF, was dedicated Sept. 22 with a ribbon-cutting ceremony attended by family and friends of Johnson and her fellow “human computers,” students from Black Girls Code and the 21st Century Community Learning Centers program, and special guests from across Virginia. Johnson held a fascination with numbers as a girl growing up in West Virginia. Eventually, she translated that love into using her math skills to help advance the nation’s space program in the 1960s. State of the art The CRF is a state-of-the-art facility that will enable innovative research and development supporting NASA’s missions. It is the third building in Langley’s 20-year revitalization plan. structure is consolidating four Langley data centers. The building incorporates energy saving features that are expected to be 33 percent more efficient than if those features had not been included. The significance of the facility is that it advances Langley’s capabilities in modeling and simulation, big data and analysis. Powerful computers like those in the CRF are capable of ever more complex analysis and simulation, in some cases replacing but also validating and complimenting the research done in NASA’s labs and wind tunnels. The CRF also houses an office area for researchers to do their work. Johnson was a “human computer” at Langley who calculated trajectories for America’s first spaceflights. She worked at Langley from 1953 until retiring in 1986. Her contributions and those of other NASA African American human computers are chronicled in “Hidden Figures,” based on author Margot Lee Shetterly’s book of the same name. After Johnson’s story began to emerge, she was awarded the Presidential Medal of Freedom, the nation’s highest civilian honor, by then-President Barack Obama at the White House in 2015. The backstory In 1962, as NASA prepared for the orbital mission of John Glenn, Johnson was called on to do the work that she would become most known for. The complexity of the orbital flight had required the construction of a worldwide communications network, linking tracking stations around the world to computers in Washington, Cape Canaveral, Florida and Bermuda. The computers had been programmed with orbital equations that would control the trajectory of the capsule in Glenn’s Friendship 7 mission, from blast off to splashdown, but the astronauts were wary of putting their lives in the care of the electronic calculating machines, which were prone to hiccups and blackouts. As a part of the preflight checklist, Glenn asked engineers to “get the girl” (Johnson) to run the same numbers through the same equations that had been programmed into the computer, but by hand, on her desktop mechanical calculating machine. “If she says they’re good,” Johnson remembers Glenn saying, “then I’m ready to go.” Glenn’s flight was a success, and marked a turning point in the competition between the U.S. and the Soviet Union in space. Shetterly, the ceremony’s keynote speaker, praised Johnson and fellow human computers Mary Jackson and Dorothy Vaughan as being revolutionary by just doing their jobs. Shetterly said the path to the future is rarely predictable, smooth or direct – and Johnson’s was no exception. Shetterly added that Johnson’s story is one of a thirst for knowledge and a celebration of teamwork. Johnson, who received four standing ovations at the ceremony, happily recalled her time at Langley, saying that her job was to just answer questions to the best of her ability at all times, whether she got them correct or not. “I didn’t do anything alone but to try to get to the root of the question – and succeeded there,” she said.